So about 3 months ago, I decided I wanted a dark blue under-colour. The problem was my hair was black and I had little money. Firstly I stripped my faded black (using re-wind hair colour remover) then slapped on some bleach. I had to leave my hair a few weeks and then re-bleach the mids to ends to get rid of the orange. Which faded in one wash to a manky green. what a surprise! I then tried a bleach bath, but results were still inconclusive. Finally this week, I used tomato sauce on my hair ( ) which actually helped fade the green a little. The pics aren't great, but you get the idea. I'm tempted to do my whole head in it! Last edited by madebs666 on Mon Jan 17, 2011 10:28 pm, edited 1 time in total. 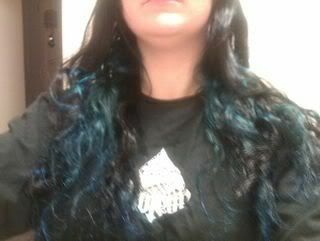 Re: My blue hair adventure! can you change the enormousness of your pics so we can see??? That last pic looks lush! Nice shade of bleu! I'd say do it all, but you may fry your hair & it's luffly & long. 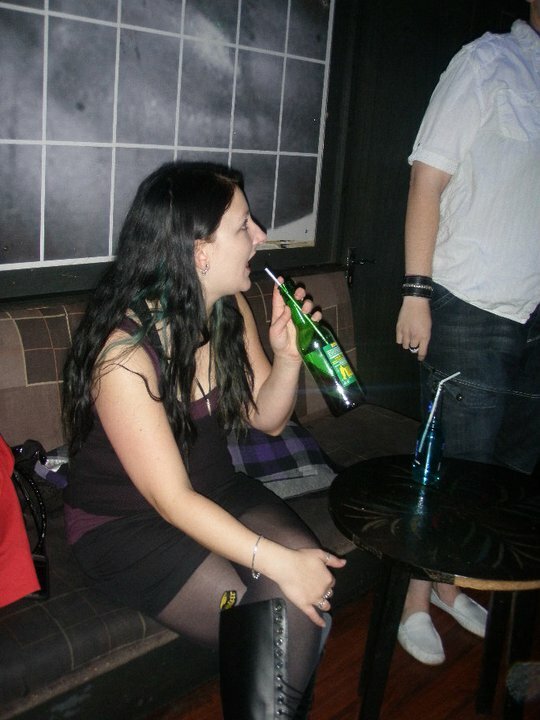 When I went blue I started with semi-permanent dyed red hair. I bleached to a banana yellow then put on Manic Panic Purple Haze, horrid color. 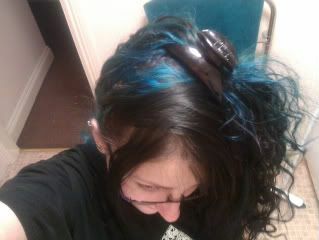 Then I used manic Panic After Midnight Blue and got a lovely very deep blue that stayed bright for a long time. It was growing out before it was fading out. I'm usually not a fan of Manic Panic and was shocked that the blue was so nice and long lasting. 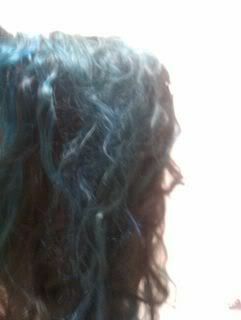 I would say the color after about 3 weeks was similar to the blue dreads in your avatar. I think the first dye with Purple Haze, which is a very blue based purple might have helped to keep the blue from fading to green even though my hair yellow after bleaching. This was certainly not the cheapest way to go blue, 2 pots of dye. I imagine that long term members of the Blue Army will have some better advice than me but I'll throw in my two cents. I love brown/black mixed with blue. If you use a more purple blue, you don't need white hair. I've had banana-skin yellow hair and whacked on dyes like SFX Blue Mayhem and Directions Atlantic Blue and Midnight Blue with no problems. I might've tried a few others too, it's been a while... Definitely recommend Directions over SFX though! I actually quite like the shade of petrol green/turquoise you've achieved, especially at the top where it seems most vibrant. Which blue dye did you use in the end? You haven't named it in your post. If you want any help with achieving a more true/deeper blue feel free to ask in the Styling and Colour section, there's plenty of comrades around to help. Yeah forgot to mention, first I used midnight blue (as suggested because it's a slightly more purple blue) but then bought 4 pots of Atlantic blue by mistake in a wholesale on here, and have been using this ever since.